A busy roundabout in Kabul, the capital of Afghanistan; the UN has welcomed a ceasefire for the Eid holiday. 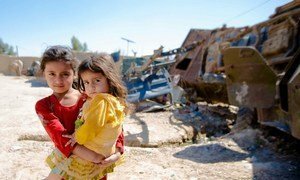 After a surge in hostilities in Afghanistan over the past weeks, the UN Assistance Mission in Afghanistan (UNAMA) welcomed on Monday the Government’s announcement of a conditional ceasefire for the Eid al-Adha holiday and called on warring parties to use this “momentum” to put an end to the conflict. “A mutual ceasefire would further the prospects for talks to take place between the parties to the conflict to find a political settlement,” said UNAMA chief Tadamichi Yamamoto in response to the Government’s announcement of the pause, which reportedly would begin today. If it holds, this would be the second ceasefire between the Government and the Taliban to be respected since conflict started in Afghanistan almost 20 years ago, following a brief pause in mid-June during the three-day Eid al-Fitr celebrations. “It is important to seize all opportunities for a negotiated end to the conflict so that all Afghans can enjoy the life of peace they so desperately want and need,” said Mr. Yamamoto, the top UN official in Afghanistan. UNAMA, whose mandate it is to support the peace and reconciliation process, reiterated that it stands “ready to play any role requested by the parties to the conflict to achieve a negotiated peace”. “This momentum must be upheld and the strong popular desire for peace must not be betrayed,” said the UN mission’s statement.